"Black with white stripes or white with black stripes?" Zebra Cone: Creamy, milky sweet white choc cream cheese mouse alternately layered with rich dark choc cream cheese mousse, served very chilled. This photo was taken with the Olympus VG-110, a small but powerful, 12 megapixels 4X zoom camera and you stand a good chance to get it when you make a comment on my posts. I have decided to wake up early to make my Jelliriffic! jellies in the morning so that I don't go into my frantic mood when the afternoon rain comes and takes away the light. The Internet was erratic last night and I had to go to Hub's office at 11 pm to upload my photos. 'Zebra' butter cake made the rounds of many food blogs last year and I just think it's such a cool cake. Zebra butter cake (which is not the same as zebra cake, which is a cake decorated with pretty pink and black stripes) is a variation of the old fashioned marble butter cake where alternate horizontal dollops of cream-colored butter cake batter and dark choc butter cake batter are arranged in the cake pan and given a stir to give a marbled effect when cut. That was then. Now someone has come out of the box and come up with alternate vertical layers of butter cake batter and choc butter cake batter which result in a Zebra print when cut. I tried it once but it didn't come out looking anything like any animal print but here's the perfect zebra butter cake for you to drool over. We've been informed that the moulds can be steamed but can't be baked but I loathe (did I just say that? Wey would say "So old-school mom" like he did recently when I said I've lost my "mojo") to do that because I don't want to risk damaging or tarnishing those beautiful shiny babies! So what can I do instead of a butter cake to get a zebra print? Gelling mediums such as agar or konyakku are not suitable because they are runny. For the colors to not bled into the surrounding layers, the batter or liquid must be viscous. What can I make that's viscous and doesn't need to be baked or steamed? It struck me one day as I was sending Wey to tuition. 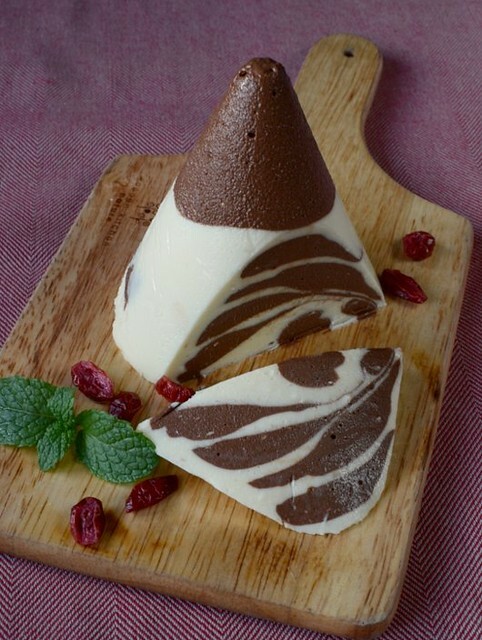 Chilled cheesecake. Yes! And so that's how this jelly came about. I wrestled between a choc-orange cheesecake and a white choc-black choc cheesecake. In the end, I used the best of both flavors: white choc and Cointreau. Can you imagine the yum? I put in too much of the first spoonful because I was afraid that the two batters will just run into each other if they were too thin. The layers didn't come out equally thick because the dark choc mousse was thick while the white was runny. Although I didn't get the zebra stripes* in my cheesecake, I'm pretty happy that the two different colors didn't dissolve into each other. Maybe during baking, the uneven rising of the two batter and all that create the stripes in zebra butter cakes? This.was.seriously.good. Especially when served very cold. You get the message. Now order a Nick Munro mould and make a zebra cone! p.s. the answer is black with white stripes. Thanks to N, who was visiting, I finally took the risk to line my moulds with greaseproof paper. It works! Just make sure the mould is lined smoothly and that the tip of the mould is dipped in warm water before turning out. 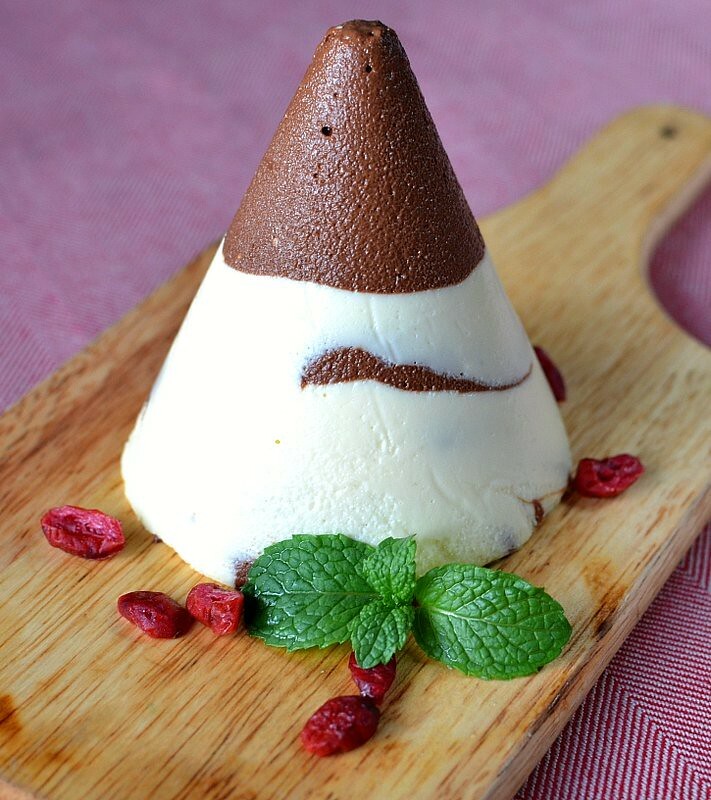 *Looking at the pattern, I know why the white mousse is more dominant. It was more runny than the dark choc mousse which was thick because I used more dark choc. I think for best results, both dark n white mousses must be of the same viscosity. I actually used 40 gm white melts and 70 gm dark choc (for more color) but have increased the white n reduced the dark in the recipe below. 1. Whisk the cheese and sugar together until fluffy. 2. Melt 50 gm white choc melts with 1 to 2 tbsp cream. Take off from heat and add 1 tbsp Cointreau. Melt 60 gm (40 to 50 gm if you don't want it too bitter) dark choc with 3 tbsp (2 tbsp if using less choc) cream. Cool. 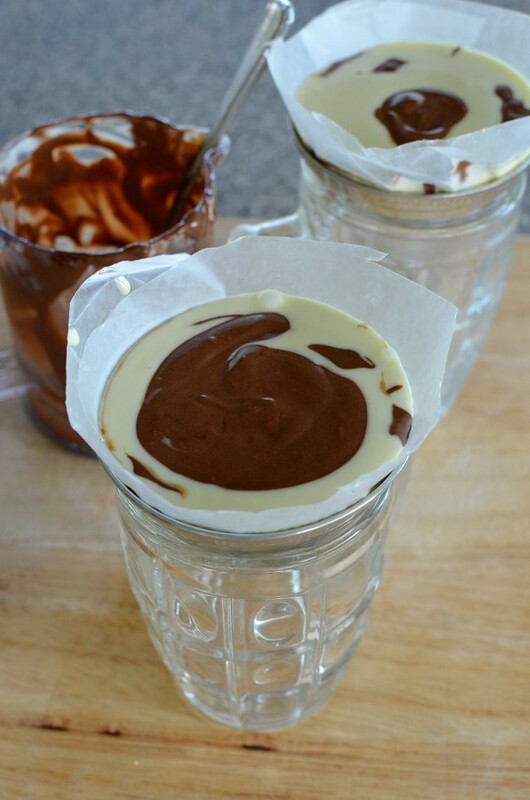 Try to make both melted choc the same viscosity by adjusting with the cream. 3. Whisk the egg in a bowl. Heat the milk and sugar, stirring until sugar is all dissolved. Remove from fire. Slowly drizzle the hot milk into the egg yolk, whisking the yolk with a small fork or whisk. Return the milk-egg mixture into the pot and heat under a gentle flame, stirring all the time, for 1 minute until the custard is steamy and hot but not boiling. Cool. 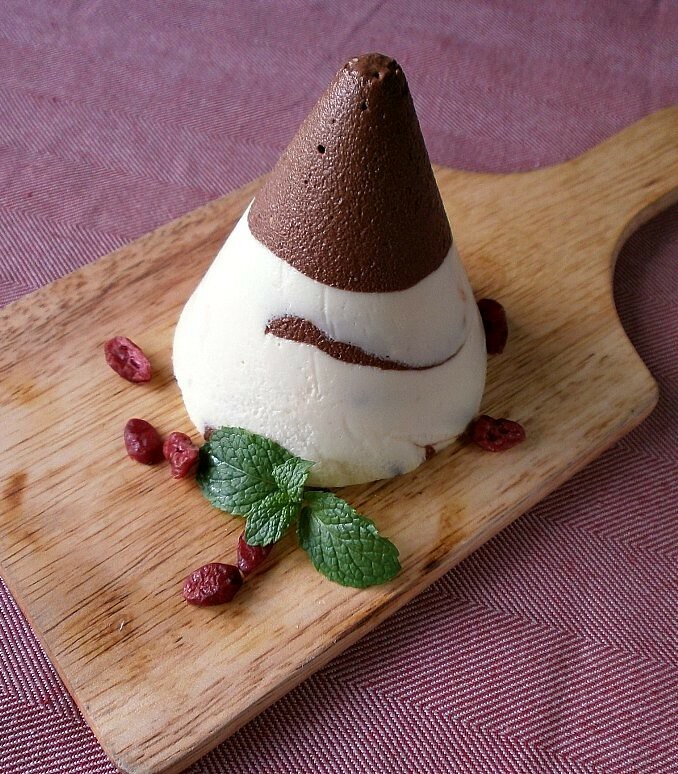 * this makes a rather firm mousse for tropical weather (and photography purposes) so if you want a softer one, reduce to 1/2 tbsp gelatine and 40 ml water. 4. Stir the gelatine and water over a gentle flame until all the sugar is dissolved. Cool. Chill in fridge until just syrupy. 5. Mix the gelatine into the custard, stirring well to blend. 6. Divide into two equal portions. 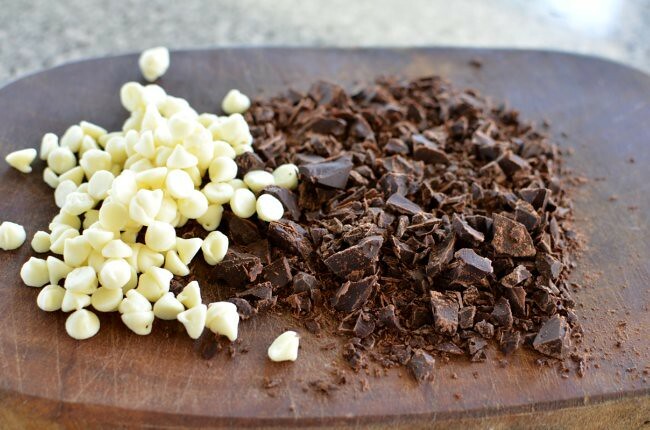 Mix one portion with the melted white choc and the other with the dark melted choc. If the batter is too runny, chill it a while but do not let it be too chilled or it'll be hard to run between the layers. 7. Prepare two Nick Munro moulds (line with grease proof paper) and scoop alternate layers of batter onto the center of each previous layer. Cover and chill for at least 3 to 4 hours. Beautiful! Love the colour of the cheesecake. So pretty in that cone shape. Looking at your cone really brought back some old memories. Zebra butter cake used to be my specialty 25 years ago. Haven't made it since. I remembered that it was very tasty and looked amazing too. Needless to say, i simply love your zebra cheesescake cone. I love the colors especially the rich choc constrast against the creamy white. Seriously tasty, i know! Looking at this gorgeous prsentation I already know it is serously good. OH MY YUM!!! Terri that cake looks so beautiful n even more when you cut it....youre a genius to consistently come up with teh best designs and recipes compared to .bla bla bla..how do you do it!. Eric wants me to try your recipes and make all those pretty and delicious looking jellies. Now, I am in trouble! If only I could send him over to yr house ha! Too beautiful to eat. Love the zebra layering on the inside. I must say all your photos are perfect and so are all your creations!! This looks absolutely Rich and Scrumptious! Love how it slices into stripes..ingenious! O my Terri, what can I say? You blow my mind. What beautiful texture and colour! And the cut insides! So beautiful! You continue to amaze. Just when I think you've reached the ultimate (like Kinabalu jelly and Sakura jelly), you come out with another ultimate.... and another ultimate.... and another .... Seriously, I think you should compile all these recipes and release a jellyriffic book! Wow! This looks so good and I am sure it's delicious. Can't believe it that you went to the office at 11 pm to upload the photos. So dedicated! Ooooo...I love the pattern. Seriously good looking. Nee. love the inside look of the Zebra effect, another nice creation! I'm so in awe of your talent Terri. Amazing.... keep it up. You inspire all of us. I would love to taste the zebra cake - would it be a great cake to bake for kids parties??!! wow, this is SO beautiful, mum...both the cake and the photos. you've outdone yourself again. have i told you i'm very proud that you're my mama? I am lost for words already while you come up with more and more amazing masterpieces everyday! Keep going, give us a climax to the finale! What a beautiful creation! I like how you cut into the cone and find the gorgeous swirly surprise inside. How pretty it looks when sliced open. Loved the patterns inside. I don't know if this looks more beautiful or delicious!! The internal layers and shapes are just fantastic!